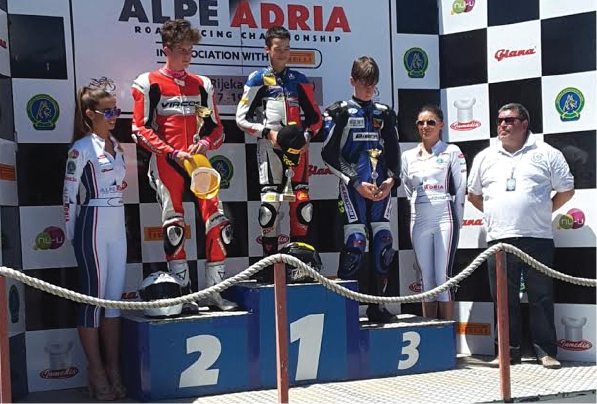 It was a weekend to forget for Lewisham based motorcycle racer Cameron Horsman, who after showing great pace in practice and qualifying failed to finish both Hel Performance British Motostar races due to crashes. The weekend started off strong for the FAB-Racing/Nova Racing Honda NSF250cc man, after finishing the free practice session only half a second second behind fastest standard class rider Mark Clayton, posting a 56.266 lap. Qualifying would see Horsman improve in time by a full second, posting a 55.223 lap leaving him in 17th for Sunday’s early first race, only one tenth of a second behind Mark Clayton who was the quickest standard man. From the lights on Sunday Cameron would make a great leap and would lead the standard class race from Clayton early on. However, as he entered the final hairpin on the first lap, the youngster would tuck the front end and crash out of the race, losing vital points in the title race. Race two and Horsman was ready to make up for what happened in the earlier race, however the weather took a turn for the worse leaving the team to work hard to find a solid wet setup after no wet practice all weekend long. After starting from 22nd position after dropping down the grid due to his crash in the first race, and from the lights he made a great leap. The youngster was hunting the leaders of the standard class race but on lap six and he was improving on his lap time he was caught out by the tricky conditions and crashed out. After the weekend Cameron expressed: “I’m disappointed with how this weekend has ended up after showing some great pace earlier on in the free practice sessions. I lost the front into the hairpin in race one which was a rookie mistake but I was pushing hard and I’m frustrated to have crashed out in race two, but the conditions caught me out. Cameron now travels to Snetterton on the 8th-10th July for round five of the Hel Performance British Motostar Championship. The weekend at Grobnik started well with good practice results on Friday then the start of qualifying on Saturday saw Cameron in the pits with a seized engine. Roberto and the team worked hard on the EE bike and for the start of Saturday’s race Cameron was second to last on the grid. Determined for success from the start Cameron was soon up with the leaders fighting hard and finishing in 2 nd place. Sunday’s qualifying saw Cameron posting some great practice times and shaving a second off Saturday’s best time. Starting Sunday’s race from 2 nd place on the grid this proved to be another very close, well fought race with Cameron taking another 2 nd on the podium; the difference between 1 st and 2 nd places being less than half a second. The next round goes to the Czech Republic 15 – 17 July. More than two hundred riders from sixteen European countries were fighting for points at the Pannoniaring in Hungary. 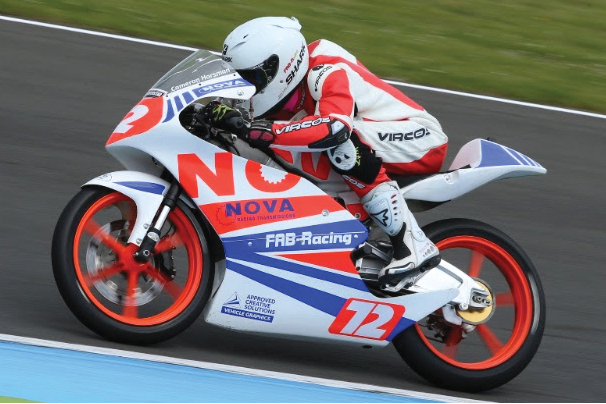 Competing in the Moto 3 class riding the Engines Engineering 125GP for FAB Racing this was a new experience for Cameron where he was the only representative in the competition from the UK. The first race on Saturday saw Cameron taking 5 th place. Sunday’s race was very close but Cameron fought hard, improving on the previous day to take 3 rd place on the podium. 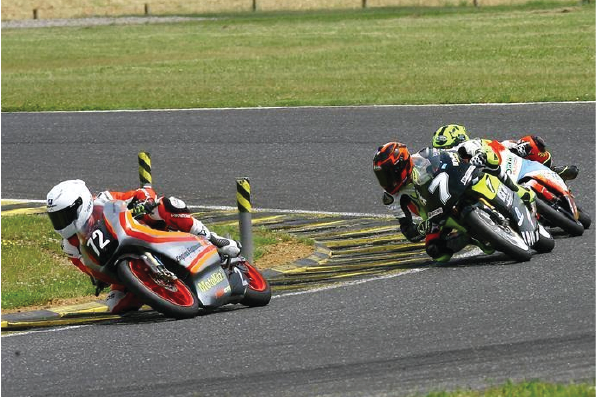 The championship moves on to Grobnik circuit in Croatia for the next round 17 – 19 June.